Book hotel rooms online with us at Auramar Beach Resort Hotel at the lowest rate, guaranteed. Get a holiday discount room rate at the popular 3 Star Hotel Auramar Beach Resort overlooking the Praia dos Aveiros in Albufeira in the Algarve. The 287 comfortable holiday bedrooms enjoy one of the most breathtaking views of the Algarve with the splendid sight of the Atlantic Ocean over a sandy beach. The Hotel Auramar Beach Resort in the Algarve provides most services and facilities that tourists expect to find on their holiday programme. There are both an indoor and outdoor pool, tennis court, sauna and steam baths, massage room, a Kids Club, a play area, a games room and mini-golf course. 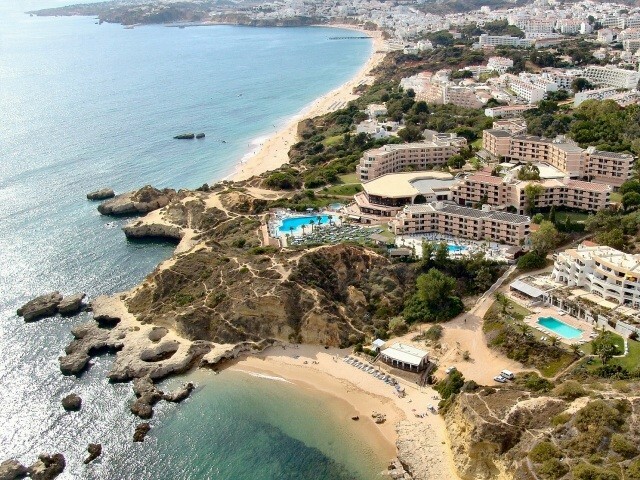 The Hotel is but some 10 minutes away from centre of the old centre of the town of Albufeira. Free Wi-Fi is available.